This week: reflecting off white, the joy jacket, and making light from radio waves. What is the best way to light a closed museum display case? External lights won't do it, because of reflection. And with lights mounted inside, there's the issue of unsightly wires. The Crypsis lighting system features LED light units sandwiched between layers of glass. The units stay solidly in place but can be moved using an external magnetic control puck. Rotating the puck dims or brightens the LED. There's a video of that happening at the link above. The really unusual thing about this system is that no wires connect the LEDs to power -- and there aren't any batteries, either. A power unit, which does connect to mains, plugs into the side of the glass panel. In some way I haven't been able to discern, it transfers power to the LEDs. Crypsis has been granted patents around the world (US, EU, Japan, Australia, New Zealand, and China). Here's the US patent, No. 7997774. If anyone would like to study that and enlighten us as to how the wireless power transfer happens, I'm sure we would all be grateful. The underlying LEDs are from Cree. The lighting units they power range from 67 to 85 lumens per Watt. CCT is 3,000K, and the CRI is 80, though there are indications that the company will produce high-CRI versions by custom arrangement. Here are PDFs of the system guide and the technical specs. Cleveland is home to GE Lighting. 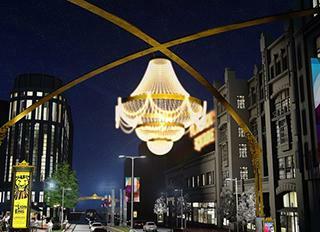 The company is helping to revitalize Playhouse Square, which will feature what the company calls the world's largest chandelier -- 20 ft. (6.1 m) in diameter, with 4,200 crystal pieces and "tens of thousands" of GE LEDs. The chandelier will be unveiled May 2. A GE press release notes that Nick Holonyak invented the first practical LED in 1961 in a GE lab. Most who work with luminaire optics are probably familiar with Dow Corning's transparent silicone materials for lenses and other light-handling elements. (We noted one of Dow Corning's award-winning moldable silicones in our Lightfair coverage last spring.) But did you know about white reflector silicone? This Dow Corning product has a reflectance of 98% at 555 nm; like its transparent cousins, it doesn't discolor with age under heat or exposure to UV radiation. Here's a spec sheet from almost a year ago for MS-2002 moldable silicone. We occasionally venture into the edgy fashion territory of LEDs in wearable form. With this note, we take a step farther toward the wild side. Here is a one-off trench coat that responds (favorably) to chocolate. The Cadbury Joy Jacket is the creation of Hirsch & Mann, a "creative technology consultancy" that seems like an extremely fun place to work. Here's the setup: You hand the coat to someone to wear. Then you tell the wearer to look in the left pocket. The wearer finds a Cadbury bar. When the wearer opens the packaging and takes a bite, the coat flashes lights over the heart, curls up its hem, and sprouts something like wings from the collar -- complete with a fountain of confetti. Here's a video.